Our site is your one stop shop for some of the most delicious digital scrapbook goodies out there! Every product created by the Sweet Shoppe designers is of the highest quality. All of our digital scrapbook papers are 300dpi .jpg images and our digital scrapbook embellishments are .png files. We add new items to the Sweet Shoppe every Friday night at 6pm EST, so no matter what you are looking for, we're sure to have something to satisfy your digital appetite! Please Note: At the Sweet Shoppe we understand that occasionally technical difficulties may make your digital files inaccessible, and we want to help whenever possible. The following are our policies regarding the resetting of downloads. 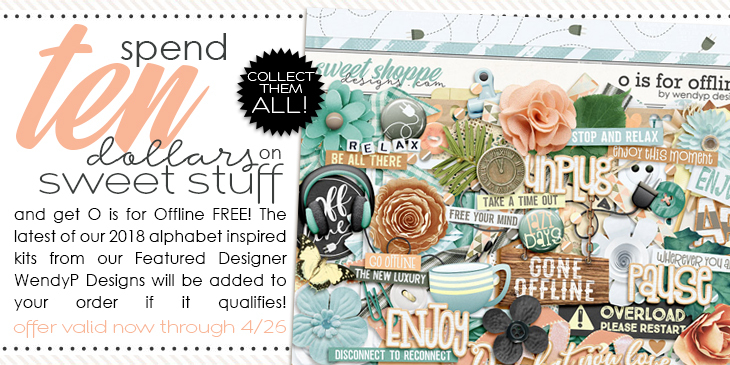 After the initial 5 day window to download, your emailed download keys will expire, however, your downloads are available directly from your order history once you're logged into the shoppe until the product, or designer, retires from Sweet Shoppe Designs. We do not reset orders older than 45 days and encourage all of our customers to back up their files. We appreciate your understanding, and thank you for supporting Sweet Shoppe Designs. Should you ever need anything, please don't hesitate to contact us.